The science behind halal food : healthy or not helathy? – cruel to animals or not? Using the Western method, the animals were apparently unconscious after stunning, and this method of dispatch would appear to be much more peaceful for the onlooker. However, the EEG readings indicated severe pain immediately after stunning. Whereas in the first example, the animal ceases to feel pain due to the brain starvation of blood and oxygen – a brain death, to put it in laymen’s terms – the second example first causes a stoppage of the heart whilst the animal still feels pain. However, there are no unsightly convulsions, which not only means that there is more blood retention in the meat, but also that this method lends itself much more conveniently to the efficiency demands of modern mass slaughter procedures. It is so much easier to dispatch an animal on the conveyor belt, if it does not move. Muslims are approximately 31% of population on earth that means we are 160 crore in the world. After Indonesia there is second large population of muslim in India. Though in accordance with muslim population halal products are not enough to meet their demands yet halal is available at least. This indicates that the popularity of halal is increasing rapidly. Muslims are demanding halal and market is providing it. Big food brands like KFC, TESCO, PIZZA HUT, are serving halal meat in their food items to meet the demands of Muslim community to earn grand profit. SUBWAY also removed ham and bacon from its store after strong urge of halal delecting Muslim. Many other small and big restraunts are getting halal certificate for their kitchen. As FOOD INDUSTRY is a vast Industry that covers veg and non veg both. So not only non veg but veg food is also immaculated from non halal elements. Dawat rice is labled with halal certificate. Boost which is now selling halal baby food served halal meat earlier. The producers of FMCG(fast moving consumer goods) are also providing halal- toothpaste, mouth wash, face and hand wash, sanitizer and many more things of daily use .Most of these are undefiled from all the constituents which are prohibited in Islam. PHARMACEUTICAL SECTOR which was as much polluted with non halal as other,now is on the way to purification. Many pharmaceutical companies are providing non alcoholic medicines. Later capsules covers were made of gelatine(driven from non halal animals) but now the toss is turning. At the urge of Muslim plant gelatine is used for capsules. COSMETIC INDUSTRY is also improving and changing its pattern of production for halal purpose. Eba and Maybelline have launched halal beauty creams, lotions ,lipisticks and many more things. They do not use non halal constituents in their products. All these mentioned efforts are made to woo and satisfy muslim consumers so that they may earn enough money. There is a large number of muslim consumers. They owe a lot to world’s economy so companies are working in accordance with their demand to extend business. Halal concept is not unknown to anyone now. The consumptions which are permitted in lslamic law are deemed as halal,and those use ables or edibles which are prohibited in consistent with Quran are defined as ‘haram ‘or non halal. Times ago it was the concern of muslim only but now due to its beneficiary nature and medical approval,halal consumption has become the need of the day. Today not only muslim but non muslim also want to consume halal. People want some reliable source to guide them in this context. Many organisations are mushrooming in home and abroad to meet the demands of the folks. HALAL SIGN is an eminent organisation in India which is playing a vital role to promote halal consumptions. Team ‘halal sign’ is invoking an awareness among people. Though halal sign needs no presentation but here l would like you to get to know about our noble services. Halal Sign is the first of its kind independent consultancy based in lndia for halal services. lt is governed by an independent board of founding members and lslamic Scholars Advisory panel from all over lndia and abroad. Our PRIME OBJECTIVE is to spread awareness of halal products in home and in abroad. We are providing customer assurance of authenticity. Our aim is to facilitate halal trade and participation of Indian companies in the global market. 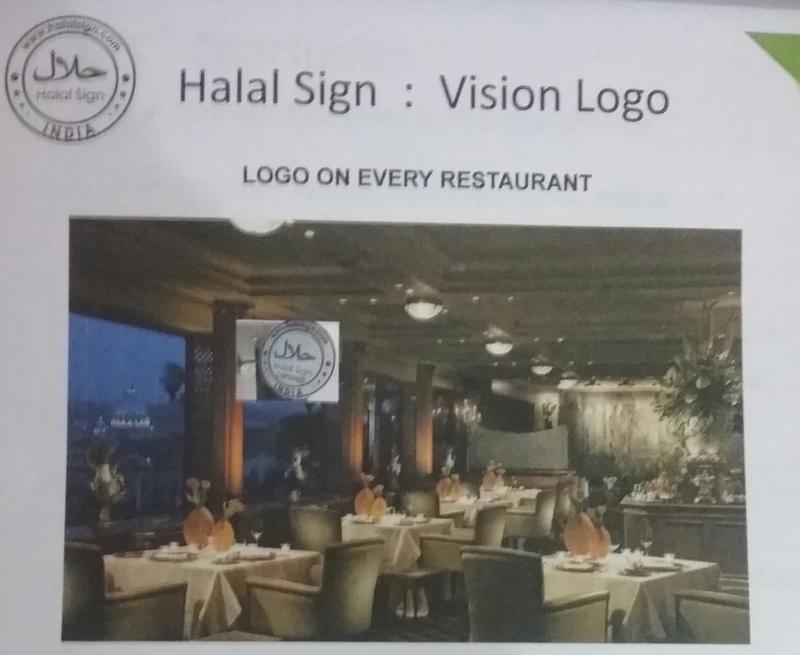 Now l would like to have an over glance at the services offered by Halal sign. It is praiseworthy that halal sign is creating world largest database of halal products both in food and non food items. We provide halal certificate for FMCG, restaurant’s,bakeries,cafetieres, hostel,hospitals and pharmaceuticals. Our eyes are spacially focussed on abattoirs. After keen observation, tests and surveys we certify them. We are proceeding more ahead by training and seminars. We have launched a HALAL NEWSLETTER, a quarterly basis publications of halal news trends latest market update etc. Halal Sign services do not end here. Our achievements are further more greater than those above mentioned. Our certificates have global recognition and of course it is recognised by the Government of lndia. Our test are associated with international laboratory partner. Halal Logo instantly provides a testimony of halal claim. We have strong technical Advisory Panel to support shariya. We have more than thousands questions from FMGC giants along with their replies. We have a responsible team for answering general public and consumers for their questions regarding halal consumptions and misconceptions. We have been a special invitee at IFA ISLAMIC FIQH ACADEMY 2015. Time to time we organise public programme in schools and madersas. If that is not halal then why? The earlier post was an overglance on the concept of halal. It was mainly to create an awareness of it among youths. We know that new generation is very curious about things. Telling them that is permissible and that is prohibited is not suffice to persuade them to follow the right one. They want reason and approval if something is halal or non halal then why it is so. Here l will do my best to answer thier ‘why?’. In lslam there are certain rules and regulations of slaughtering the animal for food purpose. In Islamic law animal is sacrificed in the name of Allah–the most merciful. A sharp edge knife three times bigger than animals neck is used to slit the juglar vein and wind pipe in only one quick swipe. When animal is slaughterd in this way even the last drop of blood is drained out from animals body. Islamic law has advocated such way of slaughtering because consumption of blood is not halal. Consumption of blood is haram means not permissible in lslam, ‘why?’ the answer is very simple because blood is harmful for our physical health. The blood is most favourable platform for bacteria to nourish. When we become sick and go to doctor the doctor will recommend blood and urine test. All the diseases minor or major are diagnosed through testing the blood. Fevers of all type—viral, malaria, dengue, chickenguenia and so on, all diagnosed from blood test. Heart problem, cholesterol level, blood sugar level or dermatological problems or orthopaedic disease all are diagnosed through testing blood. Aids and HIV test or uric acid all are depended on blood test. It is because that blood is saturated in all kind of bacteria, harmones toxins and viruses. Almighty knows what is salubrious for our body and soul. As blood is the native of germs and bacteria so He forbids us to consume blood and blood products. Even Great God has taught the animals the rules of eating, that is why they eat the harmless one. Cattle do not graze the poisonous grass in jungle. Either we are muslim or non muslim, it is our privilege to be fit and healthy. We should avoid harmful or non halal and consume halal for its fruitfulness and for the sake of our faith. There are many other things forbidden in Islam, in relation of meat consumption. These are carrion and pork, some wild and pet animals and birds etc . ln my further post l will discuss that matter too. Stay with us. Team Halal Sign is here to guide you. We care for your health and faith. Contact us at our website http://www.halalsign.com. Consuming Halal is a matter of religious faith. The edibles and other usables which are permitted to use by Islami shariya in Quran are halal, and those which are forbidden are defined as haram. Our children who are blooming into youth with the influence of Western culture are a little or totally unconscious of this faith. They do not ponder over the fact. There eat what is delicious and easily available. Being a senior Muslim guy, me think it is my duty to awake their conscience. We see that the young son of ADAM(pbuh) is very much interested in doing and eating forbidden. Among youths ready-made food, fast food, junk food and beverages are much popular. Haram ingredients are found in both veg and non veg edibles. Most of the youngsters are used to eat in hotels and restaurants as this is their outing and fun Time. If we are Muslim we have to think over it seriously. First of all we have to consider the ill effects of eating non halal. According to Islamic law it is a sin to eat forbidden ie. Pork, carrion and jhatka slaughter. Now medically it is proven the meat forbidden in Islam is harmful for health. A large number of doctors,health specialists and neutritians are advocating halal slaughter because in cutting the throat of animal from artery allowed the blood to drain out to its extreme. We know blood is suitable platform for bacteria to nourish, it means no blood in meat, no bacteria in it. While in jhatka slaughter blood is freezed in arteries and veins of animals which make the meat harmful for health due to bacteria, altogether it is hard and indigestible. Carrion- flash of dead and decaying animal is forbidden because it is harmful for health. Hotels and restaurants are using such type of meat fearlessly because we are not conscious enough to know about it.Just imagine yourself eating dead and decay meat in guise of a tasty meat or a tasty dish, how you will react? Me think you would like to throw up all you have eaten. So, dear young foodies ‘first inquire then require’. Many admixtures are added in packed food and beverages. Non halal preservatives and flavor are found in packed food. Use of alcohol in drinks is very common. We have to know whether these are harmless for our health or not. It is also to be considered that the thickeners, emulsifiers and flavours are from halal resources or not. Quran commands to take halal food before any good deed it gives energy to both body and soul. For the sake of Islamic law and health young generation should avoid all that which is forbidden. Health is a boon for us we should not destroy it by bad food habits. Be health conscious, think healthy and eat healthy. Non Halal is neither pious nor nutritious,if we are the Ummah of prophet Mohammed(pbuh) and If we are Muslim it is our duty to follow Islamic rules. Ignorance is a curse, do your best to get rid of it. Adopt all means to know the fact and try to reduce all misapprehensions. Positive effect can lead to awareness of halal among youth. Reading of related literature will help a lot. Frank communication with learned ones will be very fruitful. HALAL SIGN is at your finger tips contact and log on to http://www.halalsign.com we are eager to satisfy your queries.